Stowe School and House is a Georgian stately home nestled in the Buckinghamshire countryside. With two key sides to the business – the independent boarding and day school, and the stately home itself, the key object was to carefully balance the needs of these very different areas, while ensuring the site was easy to use and navigate. One of the main problems with Stowe’s old website was the user journey. 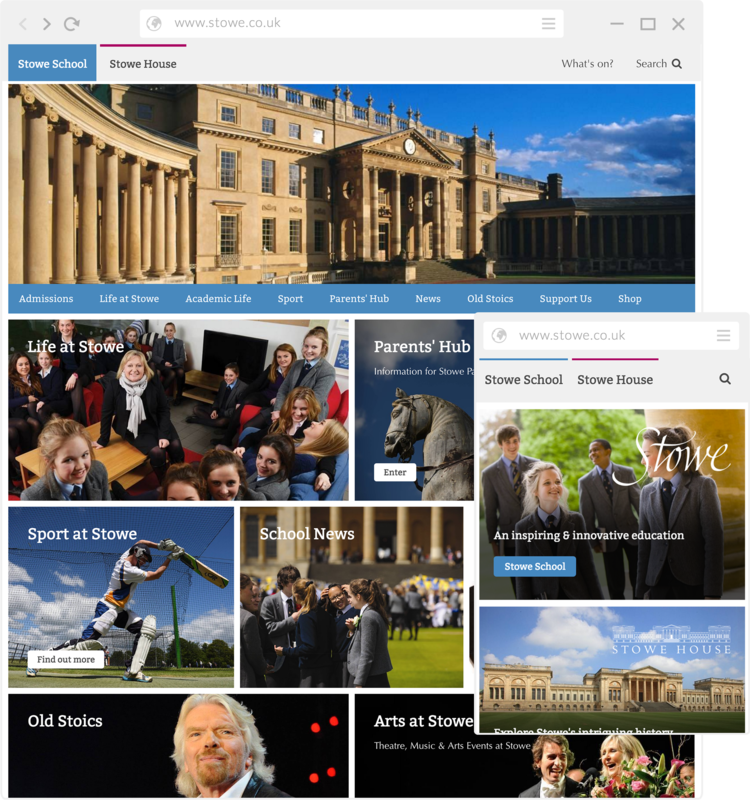 Users looking for information about Stowe House, could easily find themselves on School pages and vice versa. One of the first steps in this project was to conduct an initial scoping session to discover and explore the conflicting business and user requirements, and form user personas on which to base the designs. Following the workshop, I produced clickable wireframes and high fidelity prototypes using axure for the client to use and approve, before sharing design concepts through invisionapp. With the design concepts approved by Stowe, I built a HTML pattern library to pass to developers to build into Kentico CMS. Working with the Quba team has been a pleasure; together we have created a clear vision for our site. Not fazed by our slightly unusual business, the team at Quba were able to understand our complex requirements. Quba have worked incredibly well with the team here and were always available with advice, re-assurance and a good sense of humour! We are very pleased with the live site and all the stakeholders at Stowe are looking forward to working with Quba on phase 2 and planning phase 3.